Bob's Classic Chevy car parts will make any Chevy restoration an easy one whether you need 1957 Chevy parts for your classic Chevy Bel Air or interior accessories for your 1949 model. Bob's Classic Chevy car parts - Well known in the automotive industry for providing thousands of hard to find classic Chevy car parts to the masses, Bob's Classic Chevy delivers all of the major brands of restoration parts vital for restoring your 1949 to 1957 Chevy cars. From rubber weatherstrips to interior kits, carpeting to wiring harnesses, your classic Chevy is in good hands when you shop at Bob's. 1949 - 1957 Chevy parts - Transform your classic Chevy with premium parts that will have her purring like a kitten and looking brand spanking new. 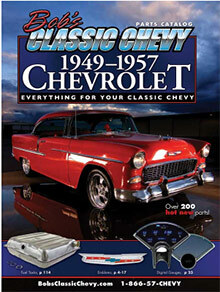 Choose from a variety of 1949 Chevy parts that will have you covered until 1957 with shiny emblems, lenses, an impressive selection of grilles, moldings, trim, mechanical Chevy parts, chassis, brake and suspension upgrades, convertible top parts, auto glass, books and manuals for your classic Chevy car. Classic Chevy body parts - Sometimes our classic Chevys have major body issues. From dented and scratched bumpers to rusty doors and damaged hoods. Take years off of your classic Chevy car while restoring her original beauty with a pair of front and rear bumpers, mounting brackets, hardware, and bumper guards for select years. Invest in replacement body repair panels, body hardware, new doors, fenders, hoods and more. Classic Chevy car accessories - Once you've handled the difficult parts of your restoration, it's time to have fun bringing in the little touches. Fill your garage with Chevy classic car parts and accessories that cover everything from A to Z including interior trim parts, classic Chevy car covers and carpet mats, Chevy parts for your audio system, knobs and handles, sun visors, seat related items, steering parts, arm rests and more items that will bring your classic Chevy into the 21st century with style. Whether you've been on the lookout for basic 1949 Chevy parts, 1950 Chevy hood emblems, 1951 and 1952 Chevy battery cables or 1953 to 1957 Chevy parts for your fuel system; when it comes to classic Chevy car parts, Bob's Classic Chevy has your car's best years covered.